The goal of your enterprise is to generate a profit. To do so, you invest in productive assets such as capital equipment, tooling, labor, and material. You employ these assets in the most efficient manner possible, while satisfying the needs of your customers. 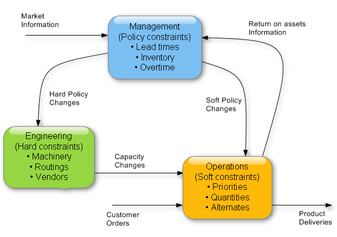 In the short term, the process of efficiently employing assets is known as production scheduling. Production scheduling involves sequencing, or placing work on resources in a particular order. In the longer term, the process of efficiently employing assets is known as production planning. This involves loading hours on resources, and subjecting the load to a capacity planning process to spot imbalances. The key to better planning and scheduling is visibility. Changing business conditions require that you modify plans constantly. Increased visibility helps you predict, with greater certainty, the costs and results of your plans, ensuring the best decisions are made. In today’s complex and dynamic manufacturing plants, this visibility is almost impossible to obtain manually. For instance, rarely do companies like yours have the time to manually calculate the effect on delivery of multiple requirements competing for limited capacity. If you were able to calculate an initial plan, you certainly don’t have the time to factor in potential events affecting available capacity, or to consider multiple alternatives to improve delivery. In order to gain this planning and scheduling visibility, companies have increasingly turned to Advanced Planning and Scheduling Software. Advanced Planning and Scheduling software lets you schedule finitely or infinitely in the short or long term. It can be for production scheduling or for production planning.